Talk about starting at the beginning. . . Whether you work with stoneware, porcelain, or earthenware, there are good (and not-so-good) applications for each type of clay when making pots for use in the kitchen.Von Dassow explains the primary properties of each type of clay, and the best applications for each. She covers the high-level analysis of porosity, thermal-shock resistance, and typical forming methods, as well as variations and specialty clay bodies. Be prepared and make wise decisions. From deciding on which clay to use for your pots to testing ware for use; from choosing glazes to testing them for food safety and durability, this section covers a lot of the basic, practical issues you’ll face when making ware for use. Don’t forget the cook! 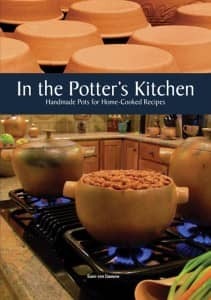 In case you don’t make pots yourself, but you want to use handmade ceramic ware in the kitchen, this chapter is meant to walk you through how to know what you are buying, what questions to ask the potter, how to know if a piece of ware is safe to use, and how to care for handmade pottery in the kitchen. When you think of ovenware you probably think of a casserole dish first. The lidded baking dish is a staple of both the kitchen and the potter’s art. Of course not all baking dishes have lids. Many wonderful foods are baked in uncovered baking dishes—think lasagna, brownies, pies, and breads. Just about any shape and size of dish can be useful, from a custard cup or ramekin holding a few ounces, to a 9×13-inch lasagna dish, ans well as many specialty bakers for things like roasting garlic or whole chickens. And don’t forget dessert! From pies and cakes to crumbles and crisps, pottery is the perfect solution. Ovenware Recipes: Judy’s Russian Rye, Sumi’s Sourdough Dark Rye Bread, Granmur’s Cranberry Bread, Maple Pumpkin Bread, Crustless Quiche, Onion Quiche, Baked Brie, Harvest Season Baked Tomatoes, Roasted Butternut Squash Soup, Oven Roasted Butternut Squash in Earthenware, Oven Roasted Brussels Sprouts, Roasted Winter Vegetables, Boston Baked Beans, Winter Veggie Cobbler, Cheesy Vegan Potato Casserole, Grilled Tomatoes, Chicken Enchilada bake, Chile Relleños, Spinach Lasgna, Roasted Sausage Peppers and Potatoes, Baked Ziti, Roasted Garlic, Braised Lamb Shanks, Exotic Pot Roast in Earthenware, Simple Chicken Roasted in Earthenware, Upright Roasted Chicken and Vegetables, Guinea Fowl in Earthenware Roaster, Salmon in Earthenware Roaster, Meatloaf, Pumpkin Pie, 100% Whole Wheat Pie Crust, Lemon Meringue Pie, Flaky Pie Crust, Egg Custard, Gluten-free Flourless Brownies, Blackberry Crisp, Gluten-free Apple Crisp, Rhubarb Crisp, Apple Cake. Cooks have used clay on direct flame for as long as there have been clay pots. That said, you’d be hard pressed to find many potters making and selling flameware because of issues of liability and the risk of cracking. This chapter covers the main issues of design and thermal shock resistance so that you can make up your own mind about whether or not to make flameware for your own personal use. More than just a tool. Well, gosh, pretty much any pot can go in the microwave, right? Not exactly. Not only are there considerations of clay and glaze choice, but chemistry as well. Porosity is a big deal when it comes to heating up water molecules (which is what microwaves do), and iron is a no-no (yes, even the iron in your clay body). Make the microwave more than a utilitarian tool. Microwave Recipes: Mexican Hot Chocolate, Baked Brie with Kahlua and Pecans, Hot brie or Camembert with Chutney, Hot Crab Dip “The Real Thing,” Baked Brie with Carmelized Onions and Herbs. Really, what pot could not be considered a serving vessel? It’s probably the largest group of ware that potters make. Though some pots used for cooking are themselves used to serve food, this chapter focuses on those specifically used for serving. Even this covers such a broad swath of ware that von Dassow breaks it down into categories for serving liquids, chip and dip, double bowls, butter and cheese, cake stands, and olive trays. Serving Ware Recipes: Edamame Dip, Spring Pea Dip, Hummus, Spinach Artichoke Dip, Lavendar Goat Cheese with Cherries, Flavored Chevre or Cream Cheese, Easist Guacamole Ever, Spiced Pumpkin Dip, Summer Salsa, Baba Ghanouj (Eggplant Purée), Favorite Family Salad, Mama’s Oil and Vinegar Dressing, Summer Herb Salad Dressing, Miso Ginger Salad Dressing. As with serving ware, almost any pot can be used to prepare food. A cook will grab a bowl to grate cheese into, a mug to whisk corn starch into broth, a saucer to mince a clove of garlic on. But some kinds of pots are designed to make certain preparation steps easier, and those pieces are what this chapter is about, including mixing bowls, egg separators, graters, and juicers. Storage Ware Recipes: Making Butter, Flavored Butter, Garlic Butter, Honey Butter, Sauerkraut, Cucumber Pickles, Kim Chi, Fermented Summer Herbs, Pickled Cucumbers and Onions, Red Beet Eggs, Chai Mixture.